In the late nineties I read about safe withdrawal rates (SWR) and became fascinated by the concept, since I was planning to retire in the next five to ten years at the time. SWR strategies are the ones you read about in financial magazines, like Money, that say you can invest your retirement portfolio in stocks and safely spend 4.5% of your portfolio’s initial balance annually after you retire. If you retire with $100,000, for example, they say you can safely spend $4,500 every year and your money is likely to last 30 years. It was an attractive proposition. You could have thirty years of annuity-like payouts and still leave a huge portfolio to your heirs — in a few hypothetical scenarios, at least. I think they’re a bad idea, but like dollar-cost averaging, SWR strategies continue to be popular despite loads of studies showing them inferior. Both approaches generate a lot of stock and mutual fund business, so I’ll leave it to you to figure out why Wall Street pushes them. I not only read about the strategies, I built my own models and monte carlo simulators (I began my career in computer science). I got to know every picky little detail of how they work and, consequently, began to understand the problems with constant-dollar spending strategies. Soon, I abandoned them. They looked like a dead end to me. I understood, statistically, how retirement portfolios in the spending phase could reach a tipping point with the SWR strategy and then begin a downward death spiral. As even SWR advocates will tell you, it happens about 5% of the time with constant-dollar withdrawals of 4.5% of the initial portfolio balance. I never really thought about models that would spend a fixed percentage of remaining portfolio balances each year instead of a constant-dollar amount, but lately I had the opportunity. I was comparing withdrawals of $45,000 a year from a million dollar portfolio (4.5% of initial balance) to withdrawing 4.5% of each year’s remaining portfolio balance. I used real S&P 500 returns from Robert Shiller’s website to generate rolling 30-year sequences from 1871 to 2008. Nine of these 108 scenarios ran out of money in less than 30 years, for a failure rate of 8.3%, but one lasted 28 years and one 29 years, so let’s round it down to a 6% failure rate and toss a crumb to the SWR crowd. The thing that surprised me was what happens to percentage-withdrawal portfolios in the scenarios where constant-dollar portfolios fail, the nine in this example. I guess I always assumed that percentage-withdrawal strategies would also fail, but that they would just keep paying out insignificant percentages of smaller and smaller portfolios. I expected them to fail, just without a clear point of demarcation like you have with constant-dollar strategies. If the economy were bad enough to decimate a constant-withdrawal portfolio, could any other strategy be that much better? But when I looked at the nine failed scenarios, that isn’t what happened. Sure, bad stretches of market returns generated lower annual payouts, but making smaller withdrawals when the portfolio was under pressure eased that pressure enough to allow those portfolios to recover. In fact, only one of the portfolios ended up with a value less that $1M after thirty years (see table below) and it held over $870,000. Strategies that spend a constant amount every year from a stock portfolio, such as the safe withdrawal rates strategy, are quite binary. You either get lucky and fund your entire retirement with a steady stream of income, or you go broke in your dotage. Percentage-withdrawal strategies don’t provide consistent payouts, but you’re far less likely to end up in the poorhouse. In fact, your chances of leaving that big check for your heirs are better. Percentage-withdrawal strategies, unlike constant-dollar withdrawal strategies, work on the time-proven financial principle that, after you lose a lot of money, you probably ought to spend less. One data point I feel is missing from this article series is the lowest withdrawal when using a percentage-of-portfolio withdrawal strategy. Is enough to provide food, shelter, and raiment (clothing) for a year? 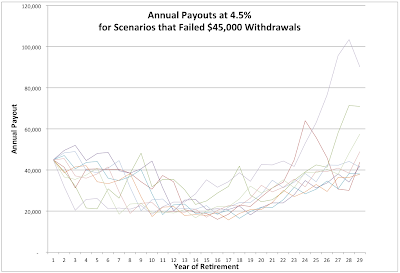 The smallest withdrawal in this example is $15,782, which can be seen on the chart. Whether 4.5% would be adequate to cover non-discretionary expenses for a year would depend, of course, on how much you spend for those items (it varies widely among retirees) and how large your portfolio is. The larger point is that if you spent more (like $45,000 instead of 4.5% in this example), you went broke. If you suffer early market losses in retirement, you have to spend less or significantly increase your risk of running out of money before you die. Those are the only options with a stock portfolio. 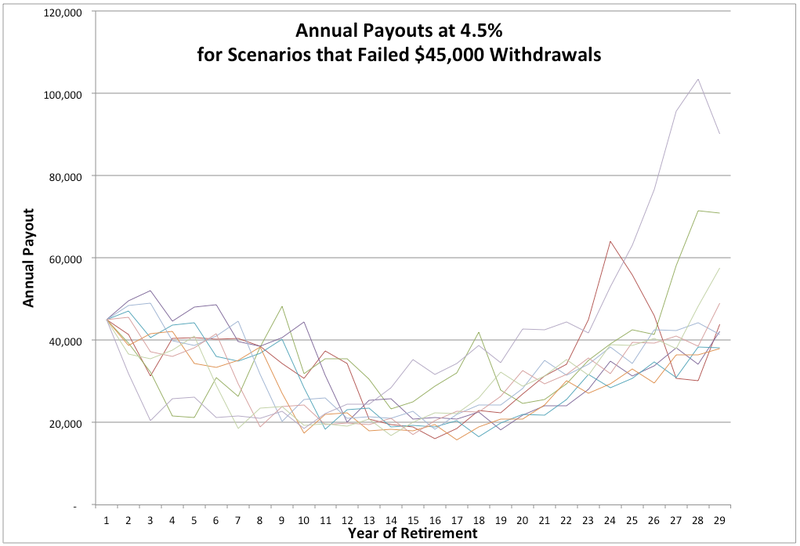 Do think when using a percentage withdrawal it could be possible to take a little higher percentage of maybe 6% in the calculations but still restrict withdrawals to the $45,000 in your example above? I think you could withdraw percentages even higher than 6% in these nine scenarios. When you do, you are transferring wealth from the end of retirement (TPVs get smaller) to the beginning (early withdrawals get larger). As percentage withdrawals get higher, the payout stream gets further from "consistent". The problem with all of this, of course, is that you can't know that percentage in advance, in other words, you can't know that 6% will work until the end of retirement, when it is too late to matter. That is the major issue with any strategy that spends down a volatile portfolio. 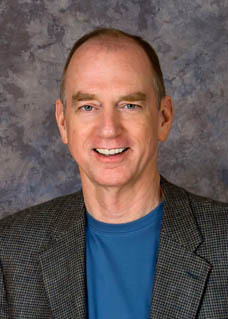 You can either keep your probability of portfolio failure constant throughout retirement by spending a percentage of your remaining balance and living with unpredictable payouts, or you can keep the annual payouts constant and increase your probability of portfolio failure when the balance declines.